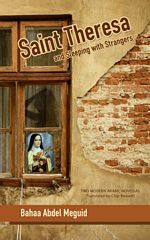 Bahaa Abdelmegid first published the slim, 96-page Saint Theresa in 2001. When it finally appeared in English in 2010—apparently it had been on AUC Press’s “to translate” list for a while—it came packaged with a 2005 novella of Abdelmeguid’s, Sleeping with Strangers. But for today, I’m just talking about Saint Theresa, a very strong short work about feelings of longing and un-belonging in Egypt’s naksa and post-naksa era; that is, after the 1967 defeat of the Arabs. Christian, Muslim, and Jewish characters find themselves being pushed and pulled apart from each other, and also apart from their previous selves and lives. This is both historical and topical; religious tensions, of course, continue to boil. While the two characters who move most of the action forward—Girgis and Budur—are Christian, the two most compelling psychological portraits are of Luka and Sawsan. Luka is a handsome Jewish clothing merchant who has decided to go on living in Egypt, the only country that he has ever really considered home, despite the difficulties and prejudices. And Sawsan is a bright young Muslim woman torn between her affection for a Marxist-then-Islamist boyfriend and her desire to break out of her life and do something completely new. This is particularly meaningful for characters searching for opportunities to be re-born. …an official police record that carried my fingerprints—prints that showed the grease left by all the people who took my hand to cross the street when I was a little girl, and the number of whacks of the cane that I received in school because I accidentally made a mistake, and all the dishes I’ve washed, and all the times I cut my fingers when I toyed with a razor without realizing the danger, and all the times my hands touched Salim’s and I felt safe with him, and all the times I raised my hands to heaven in supplication. Well-crafted and well-told, Abdelmeguid creates compelling characters caught between conflicting loyalties during an interesting historical period. The novella was translated by Chip Rossetti, who is now at work on Mohamed Makhzangi’s’s short-story collection, Animals in Our Days. You can also find Rossetti’s work on Words Without Borders, and his thoughts about the publishing business on Publishing Perspectives. Abdelmeguid has also written a collection of stories titled The Black Piano, the novella Sleeping with Strangers, and another titled Gebel el-Zina. Very interesting review – I’m adding it to my reading list!